The premium, sustainable offering of ENVIRONMENT® papers and the rich colors and tactile textures of ROYAL SUNDANCE® papers are now together in one collection: the naturals. Fall into EXTRA SAVINGS when you print on nekoosa carbonless sheets. $10 Nekoosa Bucks have arrived! A newly refreshed portfolio of high-end, specialty papers used for print communication, luxury packaging and Retail Solutions. A 100% Cotton Sheet which is soft to the touch as well as luxurious in appearance - communicating prestige and elegance. 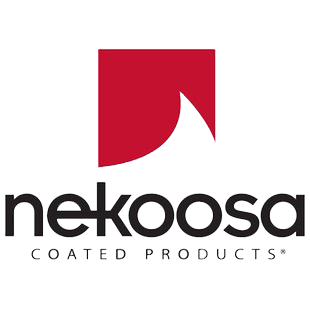 The most effective way to sell Synaps polyester paper is by showing key applications so... Nekoosa just created a new sales tool to do just that! A 100% Paper-Based Product for Branded Gift Cards, Membership Cards, Loyalty Cards and Card Carriers . The purpose of Neenah's Explore series is to help designers and printers show clients how easy it is to create materials that will make customers take notice. Created with the perfect balance of durability, power, and sophistication, the Cougar® Heavyweight Collection will certainly leave a lasting impression! Need something thinner than 14 mil? Offering a complete line of high quality pressure sensitive products for labeling applications. Including flat sheet products and die-cut labels in a wide assortment of papers, foils, and films.